Gone are the days of simply topping your salads with this veggie. There’s so much that can be done with cauliflower! 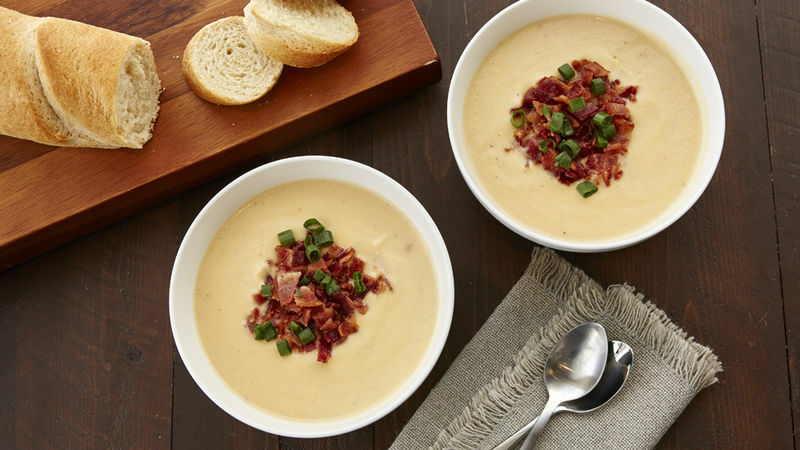 From easy apps to simple dinners (looking at you, creamy cauliflower soup) cauliflower is the new secret ingredient to making your favorite dishes a little better for you—without sacrificing any flavor! Depending on your region, peak seasons for cauliflower are in the spring and fall, but cauliflower can be purchased at your local grocery store year-round. Bonus: Cauliflower has a similar consistency to broccoli and can be substituted for broccoli in many recipes. When buying cauliflower, look for compact white florets. The head of the cauliflower should be heavy for its size and the leaves should be bright green and not wilted. You should avoid any cauliflower that has florets that have started to turn brown—this means the head is getting old. Also, if the bottom of the head is soft, the cauliflower is no longer fresh. Fun fact: Cauliflowers are not just white. This vegetable has several varieties, including purple cauliflower, orange cauliflower and even a broccoli-cauliflower hybrid called “broccoflower.” All of these varieties are similar enough to white cauliflower that they can be prepared, cooked and served in the same recipes. Orange cauliflower packs an additional punch of nutrients into each serving, with its high content of beta-carotene, and its vitamin A content. To keep your cauliflower as fresh as possible, store them unwashed in the refrigerator with the stem side down in an open plastic bag. This method will help cut any excess moisture, which will cause the cauliflower to spoil faster. Unwashed cauliflower will keep in the refrigerator for up to 7 days, while cooked cauliflower should only be stored for 2-3 days. Had your fill of cauliflower? Not to worry! There are tons of vegetable recipes for you to choose from. From carrots and potatoes to green beans and potatoes, we’ve got all the veggies you need.